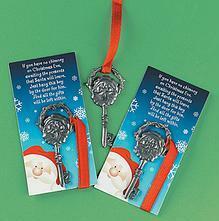 Our Gift Shop Is Open-Save Time Shop Online! PayPal™ accepts debit and credit cards on their secure servers. Choose the items you want by adding them to your PayPal™ cart using the buttons below. Be sure to add a name(s) for each recipient. This allows you to make one payment for all recipients! Once you check out and your payment is processed, you will be directed to our Thank You Page which confirms payment was sent and includes the Santa Letter Order Form to enter your personalized details to complete your order. You wll also receive an email confirmation from PayPal™. Please be sure all Order Forms are sent for all recipients you've paid for. Reference your PayPal™ receipt to ensure you send an Order Form for each person. Sorry but we are out of stock of this item. Be sure to order early next year. If you need assistance, have a question or need the Order Form link emailed to you please let us know. 1. Did You Pre-Pay At E-Bay®? If You've Already Pre-paid Through Ebay®, we will automatically send you the link to the Order Form. Simply submit your order forms and and indicate the method of payment as "Pre-paid Through Ebay".You will receive a confirmation that your order form was sent. If you have questions, please email us. 2. 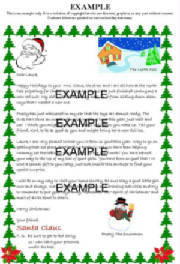 Do You Have A Gift Certificate For A Free Santa Letter? If so, please fax the certificate to us at 253-813-1534 or email us and we will send you the link to the Order Form. Simply submit your order forms and indicate the method of payment as "Gift Certificate". You'll receive confirmation the order form was sent.